Georgia wants the European Union to help it solve its conflict with Moscow over the "occupied territories" of Abkhazia and South Ossetia, the country's vice-prime minister, Giorgi Baramidze, told EURACTIV in an exclusive interview. 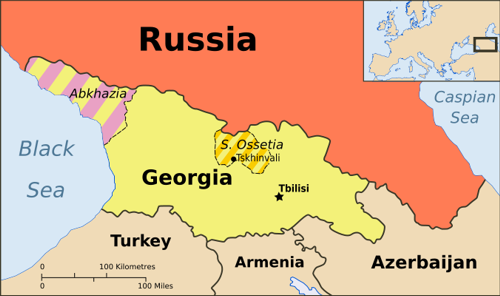 Following the brief armed conflict in August 2008, which the French EU Presidency helped to diffuse, Russian troups were left occupying Abkhazia and South Ossetia, which together represent a sizeable chunk of Georgian territory. But Georgi Baramidze, who is responsible for European and Euro-Atlantic integration, said the "open conflict" with Moscow had already existed before the 2008 war and could still be resolved. "This conflict with Russia is an important obstacle for Georgia's development. But we hope that we will be able to overcome the difficulties, with the EU more involved in the conflict-resolution process," Baramidze said. The Georgian vice-prime minister lamented that the European Union's monitoring mission at the borders of Abkhazia and South Ossetia could not cross the frontiers and enter the "occupied territories". He said he hoped the EU mission would in future be able to enter the two occupied regions and perform its duties. "We hope that in the future this mission will be able to enter occupied territories and perform its duties, according to its mandate. And we hope the EU will be much more decisive in this regard." Baramidze said that 80% of the population of Abkhazia and South Ossetia included many nationalities and ethnic groups who had been "kicked out" of their homeland and disagree with the separation of those regions from Georgia. "Ethnic cleansing was conducted there, which was confirmed by the Tagliavini report," he said. The Tagliavini report, commissioned by the EU and drafted by Swiss diplomat Heidi Tagliavini, was made public in October 2009. Its findings were used by both camps as evidence in support of their arguments. Baramidze strongly objected to descriptions of the situation in Abkhazia and South Ossetia as a "frozen conflict". "It's a huge mistake to say that we have a frozen conflict with Abkhazia and South Ossetia. We have an open conflict with Russia." "We have always had a conflict with Russia. We don't have a conflict with our own regions. Even before the August invasion and war, this conflict with Russia was never frozen. We are telling our friends: don't consider this conflict as frozen, and this situation as frozen." Frozen conflicts on post-Soviet territory (like Transnistria and Nagorno-Karabakh), or in areas where Russia has a traditional influence (such as the former Serbian province of Kosovo) is preventing the region from advancing along the path of Euro-Atlantic integration. "I'm reluctant to call those situations frozen conflicts, but […] Russia thinks that by maintaining conflicts in different areas and with different countries, it can prevent both NATO and the European Union from being enlarged, to have those countries included in these organisations. It's quite clear for everybody," Baramidze said. The Georgian vice-prime minister rejected suggestions that his country had put the objective of NATO accession on the back burner following the 2008 conflict. He admitted that Georgia had become less vocal on the issue, but insisted that preparations were ongoing, that the will of Western countries was still there, and that the necessary mechanisms were in place. In fact, following the war, Georgia did not obtain a Membership Action Plan, or MAP, which is seen as an ante-chamber to NATO accession. Instead, it was offered a different roadmap, called the Annual National Programme (ANP). But Georgia insists that an ANP is in fact equal to a MAP. "We know we need two or three years to be prepared, to upgrade our institutions to NATO standards. And then after, the ball will be in NATO's camp," he said.